» Who Are the Most Interesting Quarterbacks in the NFL? We know what we’re getting with most of the quarterbacks around the NFL. Either they’re not very good (Josh McCown, RG3, Brian Hoyer, Alex Smith), they’re very good but predictable (Peyton Manning, Brees, Rivers, Roethlisberger, Romo, Ryan, Flacco, Wilson), or they’re allegedly good but inevitably disappointing (I refuse to ever believe the Ryan Tannehill hype; Andy Dalton probably belongs in the first category). When the most important players on the field are this predictable, it’s easy to tune out. This is how I am during most Broncos games, for example. I know what Manning’s going to do, so I don’t need to watch closely to see him audible 800 times and then throw a 15-yard touchdown pass to Demaryius Thomas. Or Drew Brees — I’ve seen him scramble around the pocket and improvise his way into 35-yard bombs for the past decade. I can afford to miss one or two of those plays without ever really missing anything. Most quarterbacks are living out some variation of the same season every year. What follows is the opposite. Let’s run down the most watchable quarterbacks in football right now. This isn’t about who’s best. These are the quarterbacks who will make me stop everything to pay attention when they’re on my television. But sure, let’s start with the best. He’s the closest thing the NFL has to Steph Curry — gorgeous to watch, makes plays that are borderline impossible to explain, and demoralizing for anyone with the misfortune of rooting against him. But this season, there’s a twist. The Jordy Nelson injury was a crushing blow for anyone invested in Green Bay’s success, and Rodgers sounded more miserable than anyone. But after we got done cursing the injury gods and/or preseason football, a silver lining emerged: Rodgers is already the best player in football, and now we get to see him tested like never before. Is he good enough to make this work anyway? What happens if he turns Davante Adams into a superstar? Is Randall Cobb about to have 150 catches? Do the Packers just win 12 games by default, as long as they have the best player in football? Under different circumstances, another flawless Rodgers season would’ve been too predictable to include on this list. Now, the most gifted quarterback I’ve ever seen has an added degree of difficulty. Imagine taking away Marvin Harrison from Manning during the peak Colts years. That’s what’s happening here. It either means we’ll watch Rodgers look suspiciously mortal for a year, orrrrr … it will make it even more amazing when he throws for 4,500 yards anyway. Me before the draft: He was throwing to wide-open receivers in Oregon’s system. The Pac-12 defenses he played against were almost all terrible. When he played against a great defense in the national championship, he fell apart. That’s how the NFL will be if he doesn’t go to the Eagles. Also, he has the charisma of a doorknob, and his greatest asset (athleticism) guarantees he’ll be hurt for at least a few weeks every season. Me after watching that highlight: Yeah, OK, let’s watch the Titans this year. Let’s see where this goes. Everyone looks better in the shadow of Chip’s visor, following those play-cards. For Bradford’s part, if he can stay healthy, he’s accurate enough to be dangerous in this offense. I’m not saying that because it’s true, but because it’s a thing that all smart football fans are required to say before this season. Nobody has any idea, really. Why did the Eagles bet their immediate future on Sam Bradford? Let’s all find out together! 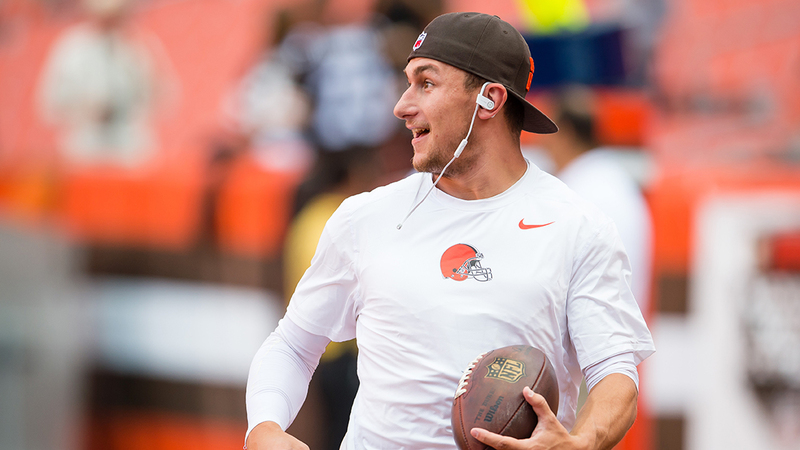 There is a strong possibility that all the off-the-field scandals are irrelevant, and it turns out Johnny Football is just too small to ever be a successful quarterback in the NFL. It may not matter that he went to rehab and abandoned the money sign. He is listed at 6-foot, just like Brees, but when he’s surrounded by defensive linemen and scurrying around for dear life, he really feels more like Doug Flutie. He takes too many chances, he’s not quite fast enough to elude the defense, and it’s not a good sign when every big play feels like a miracle. I know all of this. I understand it’s probably time to accept reality. That Bengals game last year is a tough memory to shake. I’m sorry, but I will never give up hope with Johnny Manziel. This must be how the Tebow cult feels watching the fourth quarter of preseason Eagles games. In my heart, I will always believe. He inherited a world of insanity almost overnight, and he was such an unrepentant shithead that his dedication to craft will remain awe-inspiring for a lifetime. And when he plays well, he’s still as exciting as any player in football. The Browns have a decent supporting cast, particularly if Terrance West and Isaiah Crowell can stay healthy, and Josh McCown is the most benchable quarterback in football. The stage is set. Expectations have never been more reasonable. Manziel has already lived several seasons’ worth of Ballers story arcs, and now I just want to watch him try to make this work. Let’s pause here to go through the toughest omissions from this list. Cam Newton: He could be great on a different team, but Panthers games are just too depressing. 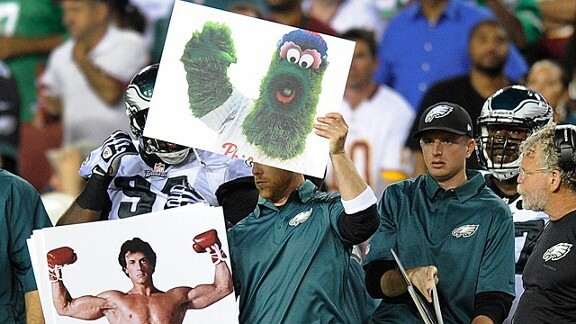 Remember that Monday-night game against the Eagles? Nine sacks! That’s the type of game that would make me mutiny if I were a quarterback. Teddy Bridgewater: Every play he drops back, I’m half-expecting him to get broken in half by some monster defensive end. Watching Bridgewater makes me more nervous than excited. Colin Kaepernick: He would be here if he weren’t such a dork. Derek Carr: He should be here — Carr Bombs! — but I can’t honestly say I’ll ever see the Raiders on TV without immediately checking to see what other game is on. And … that’s about it. Jay Cutler? Robert Mays had a wonderful look at the Cutler era this week, and it ends on the perfect note: This isn’t over. It’s never over. Bears fans are talking themselves into Cutler as we speak. He is always just good enough to trick people into believing that this year could be different. Cutler is here because he’s the worst good quarterback I’ve ever seen. His body language makes me laugh out loud. He makes decisions so indefensible and inexplicable that the only reasonable conclusion is that he stopped caring five years ago. He makes me smile more than any other quarterback in football. His entire existence is a prank played on people who take pro athletes too seriously. This is the quarterback who really does provoke a mutiny on the field. He really did shove his offensive lineman on national TV. When Martellus Bennett was asked about Cutler’s leadership skills this offseason, he said, “Why does everyone always assume the quarterback is the leader?” He was benched for Jimmy Clausen. Nobody should be able to recover from that, but of course Cutler did. I can’t wait to watch him throw his first off-the-back-foot interception this year, before slumping his shoulders over to the sideline. Jay Cutler is the super-bacteria version of Jeff George, and as his career winds down, everyone should be cherishing these memories. I’m glad it’s been this way for the first few years. It’s made his games more exciting than the Colts ever were when Manning was doing his OCD savant routine. For a quarterback who is considered the heir apparent to the blue bloods of the past 15 years, Luck doesn’t exactly have polish yet. 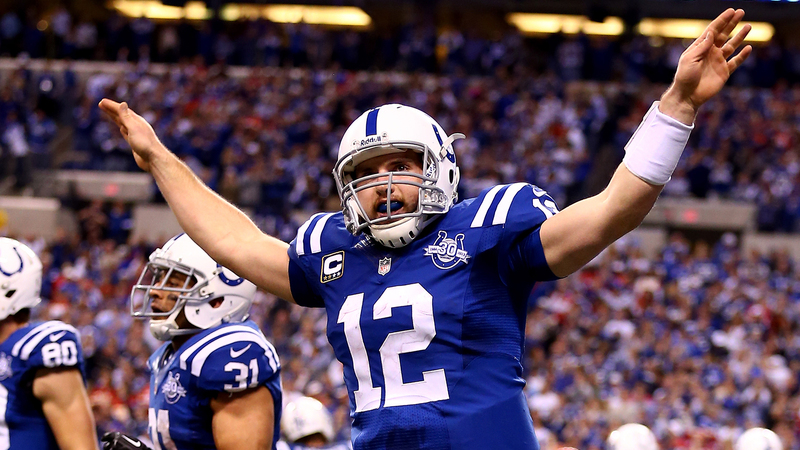 Luck looks fallible for most of the game, which makes his superhero plays even more impressive. That win against the Chiefs was a microcosm of the whole Andrew Luck Experience. He was just ordinary enough through the first half to set the stage for one of the most memorable playoff comebacks in history. Now, it’s Year 4. Given the hype that he’s gotten the past few years, it’s fair to start asking: When does he stop looking ordinary at all? This year should be a fun test. With Andre Johnson, T.Y. Hilton, Donte Moncrief, Duron Carter, and Phillip Dorsett, he’s got more options than ever. He’s already more fun to root for than anybody else. Let’s see if Luck can go scorched-earth now. There’s off-field Jameis, and there’s on-field Jameis. There’s lots to be said about how one does or should affect the other, but for our purposes, we’re talking about Jameis simply as a quarterback on a team that desperately needs a good one. Bucs optimism has become an annual tradition at Grantland. It’s what we do. And then the Bucs fall apart by October. It’s what they do. But just for the record, all of those broken dreams from the past few years came with a train wreck playing under center. But with Jameis? 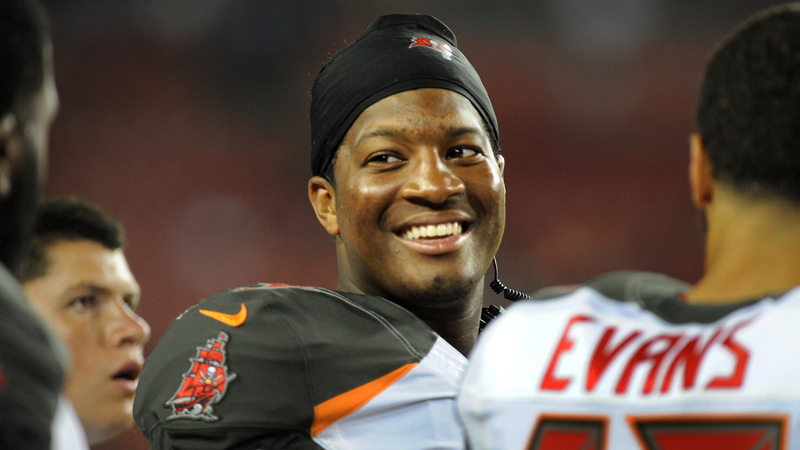 The Bucs could be pretty great if Jameis can be good. They have stars on defense (Lavonte David, Kwon Alexander, Gerald McCoy, Alterraun Verner), on offense (Doug Martin, Vincent Jackson, Mike Evans), and they even have the Barnwell co-sign. If their quarterback is decent, this team is dangerous. It will make every Tampa Bay series twice as exciting, because we’re still not sure exactly what’s there with Winston. He makes horrible decisions, throws wobbly passes into traffic that make you second-guess his future, and then he’ll throw a perfect strike up the seam for a 20-yard first down. It was like this at Florida State. It will be like this at Tampa Bay. There will definitely come a time when he settles comfortably into one role or the other — rich man’s Geno Smith or poor man’s Andrew Luck — but until then, every drive is an adventure. He could have a 5-11 season, or he could lead the Bucs to the playoffs. Here we go. And then, the most obvious choice on the board. This piece has been updated to correct how many years Andrew Luck has been in the NFL. Deshaun Watson Goes Electric: But Can the Second-Year Clemson QB Stay on the Field?